Ask Mr. Sage: What Sages Grow in Clay Soils? I live in semi-arid New Mexico. My sister, who also gardens, has an abundance of rain due to living in Georgia. Oddly enough, we both have difficulty growing Salvias due to clay soil. However, my sister has succeeded in raising Bog Sage in a shady part of her yard. We're tired of murdering Salvias in our gardens. What do you suggest? Plant failures are always disappointing. Densely packed clay soils can be especially difficult for Salvias when damp, because all Salvias prefer well-drained soil (some can't live without it) to allow roots to breathe and grow. Drowning can occur even in dry climates if your region experiences periods of heavy rainfall. 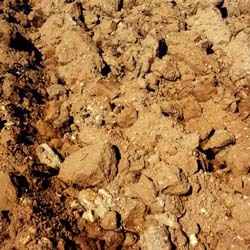 However, clay is rich in nutrients. While many Salvias prefer nutrient-poor soils, there are many that love the rich life. Some do best in drier clay soils; others can handle damp clays in specific drainage situations, such as slopes. I'll offer some specific suggestions in a bit, but first it helps to consider soil amendment. Whether you live in a damp or dry area, it's always helpful to break up clay soils with regular additions of organic matter, such as compost. Construction of raised beds containing loamy topsoil purchased from a local nursery is one of the best solutions for giving plants a head start on healthy growth when soil conditions are difficult. Shrubby salvias that are meant to be deep-rooted eventually find their way into the clay beneath the planters even if they are lined. Creating nutrient dense waste matter called castings. So give earthworms some thought before launching a raised-bed project. Lots of methods exist for construction. Here is an overview of different techniques to help you think about whether raised beds are a good solution for your yard. All of the zones in the following recommendations refer to USDA Cold Hardiness Zones, which concern average low winter temperatures. Creeping Sage (Salvia sonomensis spp. ), Zones 8 to 11. Damp Climates. You already noted Bog Sage as being a good plant for damp, clay soils. It is extremely adaptable, which is why we also included it in our semi-arid list. While Bog Sage doesn't need high fertility soil, it doesn't mind richness. Hummingbird Sage is another choice adaptable from dry to wet conditions. Few sages thrive in persistently damp soil. None except for Bog Sage can handle damp clay in flat situations. However, on slopes, even clay soil will drain, so that is another planting option for Salvias under these conditions. If you have more questions about how to select Salvias for your local conditions, please contact us. We're always willing to help. Ask Mr. Sage is a question-and-answer feature based on topics raised in calls and emails that Flowers by the Sea receives. To send a query, just click on the Ask Mr. Sage button on this page. I have ordered online from quite a few vendors. The plants from Flowers by the Sea were extremely well packaged, well sized and very healthy. I will order again in the future with no hesitancy. The best best choice I seen for plants to attract hummingbirds. All of the plants that I received are among the best sent by any vendor! They arrived incredibly full, intact and with blooms. For hard-to-find plants, FBTS is worth the price and shipping. Great service, outstanding selection. I'd order from them again. I love the plants I have ordered! They are so healthy and very strong stemmed. They are doing very well in my garden. Highly recommend ordering from this nursery. Thank you for the plants that arrived today. They look great.